Christopher Ames uses his music to get to the heart of our faith and to tell the story of his journey thus far. He's a simple guy. An earthly guy. A loving husband. A dad... But when he's performing the music that comes from the depths of his soul...you feel like he's your best friend too! Perhaps this is the reason why he was chosen as Favorite Acoustic Rock Artist of the Year at the 2005 & 2008 KCCM Awards, Songwriter of the Year and ARTIST of the Year at the 2006 KCCM Awards and was the first ever recipient of the SPIRIT OF UNITY AWARD presented at the 2006 Indie Momentum Awards in Nashville, TN. He's a contemporary Christian combination of John Denver and Kenny Loggins with a little bit of The Beatles thrown in there as well. Chris blends the raw sounds of an acoustic guitar with honest lyrics born of a life filled with both thorns and grace. "Every life holds places of brokenness and mine is no different. But in the grace of Jesus, we are loved... and our wounds are being tended. Much of these expressions are heard in his CD titled BELIEVING BEYOND THE SHADOWS. With music, Chris shows there is a light stronger than any darkness and even when we can't see the light we know we have to hold on and believe. Christopher Ames has been blessed with significant radio success with several tracks from BELIEVING BEYOND THE SHADOWS. Rev David R Grate of the American Christian Music Exchange recognized BILBO and THE BOYS as a top pick song for Father's Day 2005. THE REMNANT also achieved critical acclaim and was a finalist for SONG OF THE YEAR at the 2006 KCCM Awards. In 2006, Christopher Ames released an instrumental CD titled, TAKE IT IN. This CD is inspired by the quote by Francis of Assisi that reads "Spread the Gospel whenever you can, use words only when necessary." The CD includes original acoustic compositions along with an assortment of traditional hymns and cover tunes with Christopher Ames' arrangements. One of the first songs released from this album is the popular hymn ON EAGLES WINGS loved by audiences of all ages. His slideshow video for this song has received overwhelming comments. In 2007, Christopher Ames received a MOMENTUM AWARD for Instrumental Artist of the Year for his work on TAKE IT IN. In 2008, Christopher Ames released his 5th studio recording on the Remnant Music Group label, and industry professionals are calling it “his best CD to date”! EVERYDAY WITH YOU is a cohesive collection of songs that chronicle the journey of life and love in marriage. Stylistically presented with a pop/rock sound, this project is a multi-faceted scrapbook of memories, hopes and dreams. In addition to his own songs, Christopher Ames also has several co-writes with some notables including Bob Halligan Jr of Ceili Rain, and Whiplash Recording Artist, Jill Parr (who helped pen the title track). There is also a new arrangement of a popular wedding song written by John Denver. Produced by Joe Hand of Joe Hand Music Productions in Nashville, TN, EVERYDAY WITH YOU is sure to win the hearts of audiences from young adults just starting their journey to those celebrating marriage milestones. In addition to his commitment to music, Christopher Ames actively supports the work being done at Remuda Ranch, Ophelia's Place and other National Eating Disorder Awareness organizations. Christopher has a personal testimony with this subject as his own wife has been struggling with an eating disorder for many years. Christopher offers a different perspective on this issue. His thoughts come from the perspective of husband and father and how he has had to deal with this disease in his own family. Many men may choose the path of abandonment, but Christopher shows how commitment can help lead to healing. Christopher Ames is available for speaking engagements in which he shares his personal testimony regarding this issue with both words and music. "Everyday With You" Reviewed by RadioIndy.com! 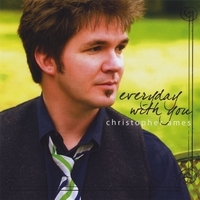 "Everyday With You" by Christopher Ames is a powerful adult contemporary album centered around love, family, and the journey through life. Christopher's voice is intimate and pleasant and has a great quality that lends itself well to the style. The production value of the album is very good and the arrangements are mellow, well-layered and very appropriate for the sound. There is a lot to hear in each and every song. All in all the songs are well thought out and well performed. This is an enjoyable CD for the entire family. Highlights include the title track "Every Day With You," a beautiful story with great lyrics and a great vocal performance. "Legacy" features a nice Rhodes organ progression and gets pretty powerful when it kicks in. "Pictures of Us" is another great story with a positive message and a strong groove. If you enjoy inspirational adult contemporary songs that will have you reflecting on your life and family, you'll enjoy this CD. FOR IMMEDIATE RELEASE Remnant Music Group artist wins 2008 KCCM Award! Liverpool, NY, April 30, 2008-Remnant Music Group is pleased to announce that CHRISTOPHER AMES was recently recognized as an award recipient at the 2008 KCCM Awards held in Kansas City on Saturday, April 26th. CHRISTOPHER AMES received the award for ACOUSTIC ROCK ARTIST of the Year. Christopher travels extensively throughout the country promoting his music ministry. He is also an advocate for Eating Disorder Awareness. Just recently he released his 5th studio recording titled-Everyday With You (a musical journey of life and love in marriage). Recognition for his work in Christian Music is a tremendous blessing for which he admits, “I am truly humbled and gracious for this encouragement.” CHRISTOPHER AMES previously received the Acoustic Award in 2005, along with Artist of the Year, and Songwriter of the Year in 2006. The KCCM Awards are sponsored annually by KingCat Music based in the Kansas City area. This organization serves to recognize artists who are part of the KingCat Music network in a variety of award categories including Artist of the Year (in each music genre), Group of the Year and Song of the Year. KingCat Music includes local, regional and national independent artists that perform in the Christian music genre. The awards are held each spring at a Kansas City area venue. Sponsors for the event include notable businesses, professionals in the Christian music industry, along with several radio stations, and news periodicals. A Journey of Life and Love in Marriage and Music Liverpool, NY, April 7, 2008—Remnant Music Group is pleased to announce the new CD release from multi-award winning independent artist, Christopher Ames. EVERYDAY WITH YOU is a concept album that focuses on the journey of life and love in marriage. Each year, new information regarding marriage; and divorce rates, is printed in our newspapers, magazines and spread across TV and the internet. Just as billions of dollars each year are spent in the wedding market, the dollars spent on separation and divorce also continue to climb. Christopher Ames has cleverly crafted a cohesive collection of pop/rock songs that takes the listener from courtship, to marriage, to starting a family… through hard times that (for some) may become the breaking point of the relationship…to the point of finding hope in working through troubled times in an effort to celebrate a long and fulfilling life together. In addition to his own songs, Christopher Ames also has several co-writes with some notables including Bob Halligan Jr of Ceili Rain, and Whiplash Recording Artist, Jill Parr (who helped pen the title track). There is also a new arrangement of a popular wedding song written by John Denver. Produced by Joe Hand of Joe Hand Music Productions in Nashville, TN, EVERYDAY WITH YOU is sure to win the hearts of audiences from young adults to those celebrating marriage milestones.